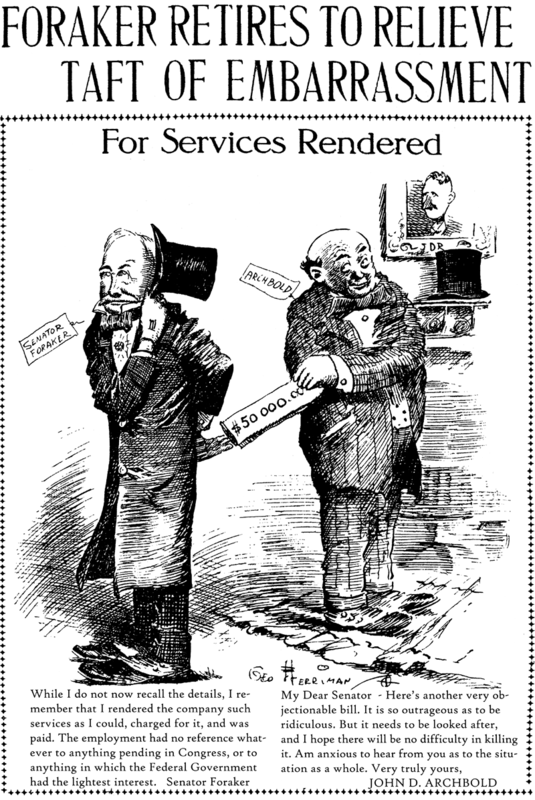 Sunday, September 20, 1908 -- William Randolph Hearst effectively ends the public life of Senator Joseph Foraker when he publishes letters to him from Standard Oil vice-president John D. Archbold. In the letters Archbold seems to indicate that Foraker was being bribed for killing legislation that was harmful to Rockefeller's rapacious oil company. Sorry for the reproduction on this cartoon, but the microfilm was in really bad shape on this page. The text along the bottom of the cartoon is a replacement, as the original was close to impossible to read.